The musical opens with Syracuse’s celebration of Archimedes’ new discovery: the compound pulley. As Archimedes and the crowd sing “We Can Move The World”, Archimedes uses his invention to haul a ship out of the water onto land. The citizens of Syracuse are amazed. King Hieron hails him a hero. A golden crown is dedicated to the gods to thank them for their good fortune. Archimedes greets Artemisia, whom he has romantic feelings for, and we meet Kleptis, her father, and Syracuse’s goldsmith. 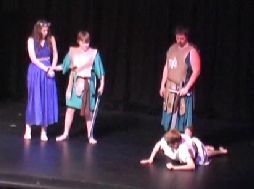 The King tries to chat up some of the dancers, but Kleptis (the goldsmith), sings “The Plan”; he is clearly not happy with the King. While some of the citizens are talking about the day’s events and the crown, the rumour starts that the crown is not made of pure gold. The song “Have You Heard The Rumour” begins and the news reaches King Hieron, who then calls a Royal Council meeting. 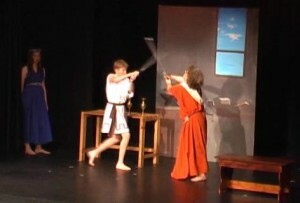 Kleptis is brought in under guard to be questioned, but he denies that he has stolen any gold. Archimedes is asked to determine whether the crown is made of pure gold or not. He realizes that he must keep his relationship with Artemisia secret until he solves the problem. We hear the song “Analyse the Gold”. 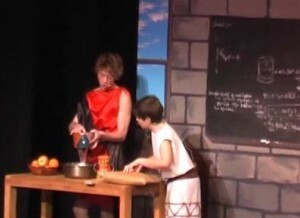 Archimedes visits Kleptis’s house to tell him about the task that he has been given. He tells Kleptis that if the king knew about his relationship with Artemisia, he would suspect that Archimedes may be an accomplice in the theft. Artemisia is shocked by the news that her father is being investigated for a capital crime, and by the fact that she will no longer be able to see Archimedes. He reassures her that he will do everything he can to exonerate her father. Archimedes and Artemisia sing “One Discovery Away”. Archimedes is called into the palace to update the king on his progress. He tells the king that a 30-grain crown made of a mixture of gold and silver has a greater volume than 30 grains of pure gold, but confesses that he does not know how to determine the crown’s volume. The king is furious and announces that Archimedes’s school is to close until a solution is found. 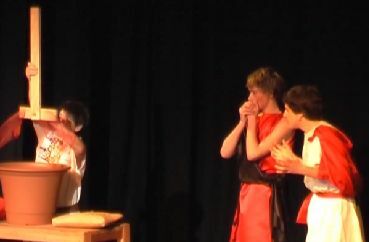 Prince Gelon, who is a good friend of Archimedes, tries to reason with the king, but to no avail. 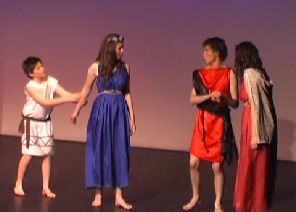 Later, the Prince encourages Archimedes to meet Princess Damarata. Damarata is smitten by Archimedes, but Archimedes excuses himself. Archimedes goes to his school, where his good friend Heracleides is teaching the students the play Antigone. 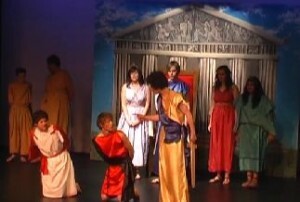 Heracleides and the students praise the play, but Archimedes tells them that he only has Mathematics on his mind. The students sing “More Important Than Life Itself”: mathematics and technology are important, but so too is Drama! Archimedes announces that the school is to close. They are stunned by the news. Archimedes returns home where his servant Diakonos encourages him to have a bath. As he steps into it, he notices the water overflow, and immediately knows how he can test the purity of the crown. 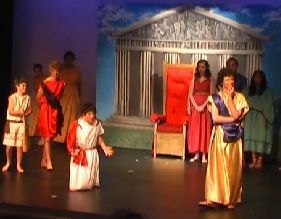 Diakonos, Archimedes and the Syracusans sing “Eureka”. However, Diakonos asks, “what if Kleptis did steal the gold?” It is only then that Archimedes realizes that he must test the crown in secret: he can’t be responsible for causing the execution of his own future father-in-law. They arrange to visit the palace just before a dance troupe arrives to entertain the king. Archimedes is given permission to take the crown from the temple, but Damarata is made to accompany the crown. The dance troupe arrives and dances to “Rhythm and Rhyme”. The king asks everyone to clear the court except for one of the dancers. He tells her that she can become his next queen. Prince Gelon spies on the his father and calls his mother. Queen Philistis arrives to thwart King Hieron’s plans. The king denies that he was doing anything improper: he was merely talking to the girl about her craft. He then announces that he will call in Archimedes. Queen Philistis tells Prince Gelon that Hieron is no longer fit to rule and that Gelon must overthrow this tyrant. They sing “A New Day”. Archimedes, escorted by Princess Damarata goes to the treasury to obtain some pure gold. To rid himself of Damarata, he pretends to take a romantic interest in her, and asks to meet her in her chamber, where perhaps her maids can prepare a tasty meal. Damarata is only too happy to comply, so Archimedes, Heracleides and Diakonos can now test the crown in secret. They set up their apparatus and test the crown. What follows is a tour de force of action, drama, tension, conflict and humour, and no synopsis could do it justice!! Visit the Contact Us page to order a copy of the script to peruse. To order Archimedes, or to request a preview copy of the script, go to the Contact Us page. The themes that Archimedes explores are summarized below. · Good deeds in the past do not excuse sins committed in the present. · A reputation must be maintained with good deeds. It can easily be destroyed by bad deeds. · The desire for revenge can destroy your soul. Revenge is never golden. · A pure heart is more important than pure gold. · Life is more important than anything. · Civil laws should be followed as long as they don’t ask you to act immorally.